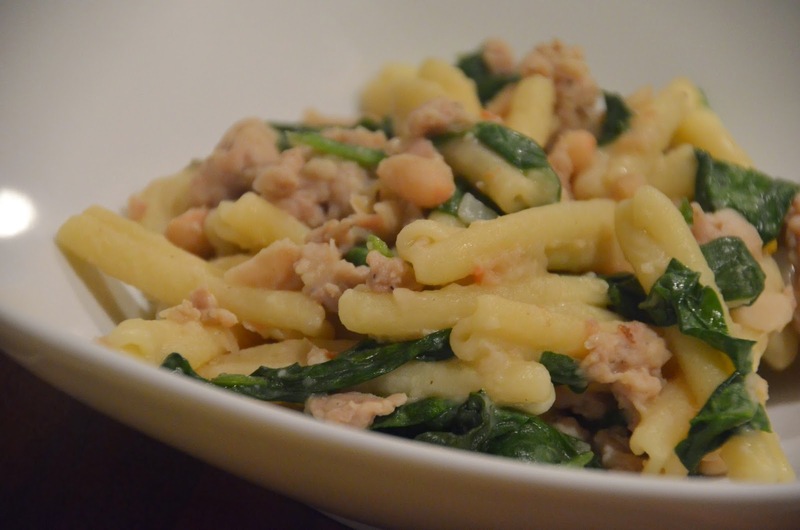 It took me 20 minutes to find the right wording for the title of this post, which makes no sense because the recipe is super simple. If anyone has a better title, please by all means, come forward. The hubs brought home a pound of apple chicken sausage from a local meat market called DC Meats. My husband’s family is actually good friends with the owners (The Gill’s) but they hadn’t seen us since our wedding. Jason went in there one day to say hi and then left with a pound of apple chicken sausage. I will be the first to admit that I have OCD when it comes to purchasing food, everything I buy typically already has a reserved spot in my weekly meal plan. So when my husband brings home surprises I get a little…antsy. I gave myself a day to figure out what I would create with the surprise ingredient. Yes I know that you only get about 12 seconds on chopped to figure that out but this wasn’t reality cooking TV, this was just reality…there would be no $10,000 prize so who cares if I broke the rules! I came up with the following recipe and I think you’re gonna like it…a lot. 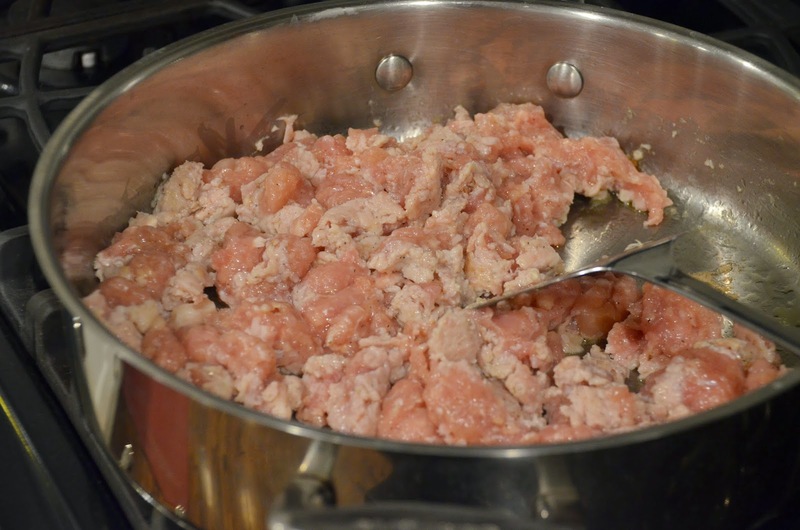 Of course the first thing you need to do is get the chicken sausage out of the casing and into a large skillet on medium heat, use a wooden spoon to break the sausage apart into smaller pieces. You also need to get some water boiling in a separate pot for your pasta. 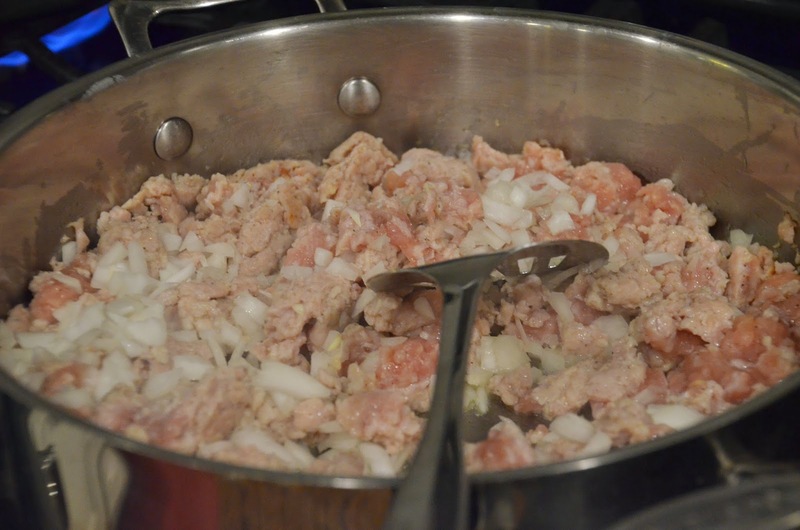 Now add your onion to the skillet and continue to saute everything over medium heat. 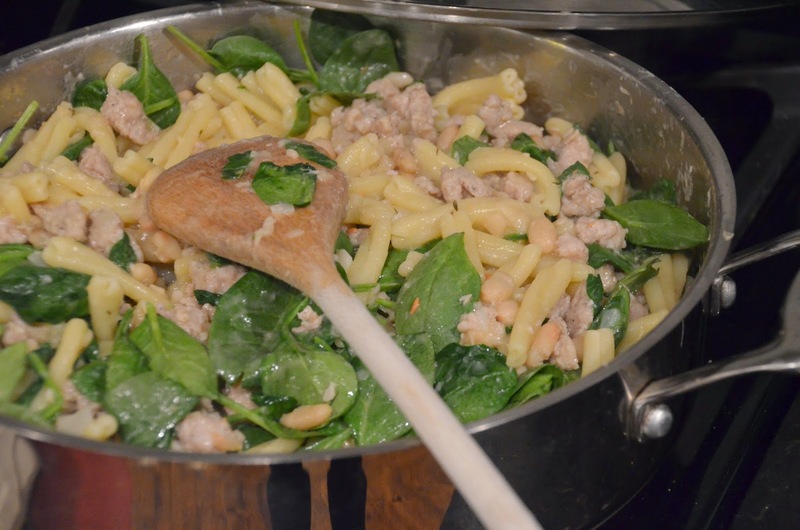 Also add your pasta to the pot once your water is boiling. 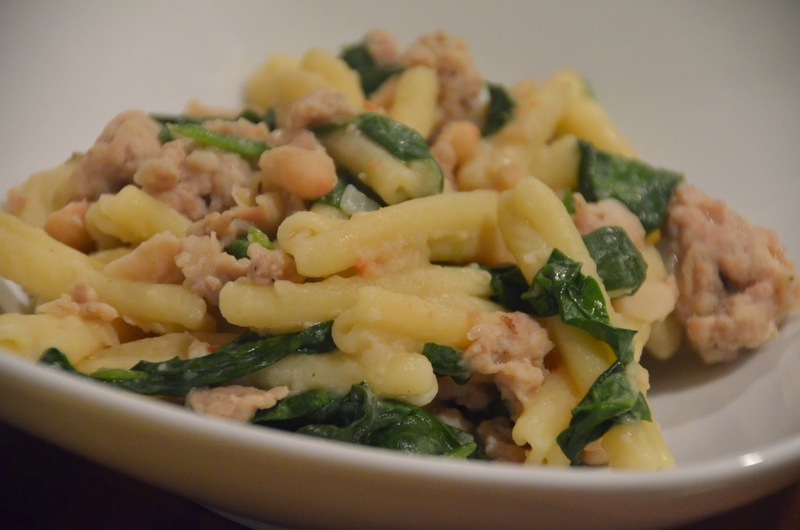 I usually throw in a few spoonfuls of course salt into the water to enhance the flavor of the pasta. 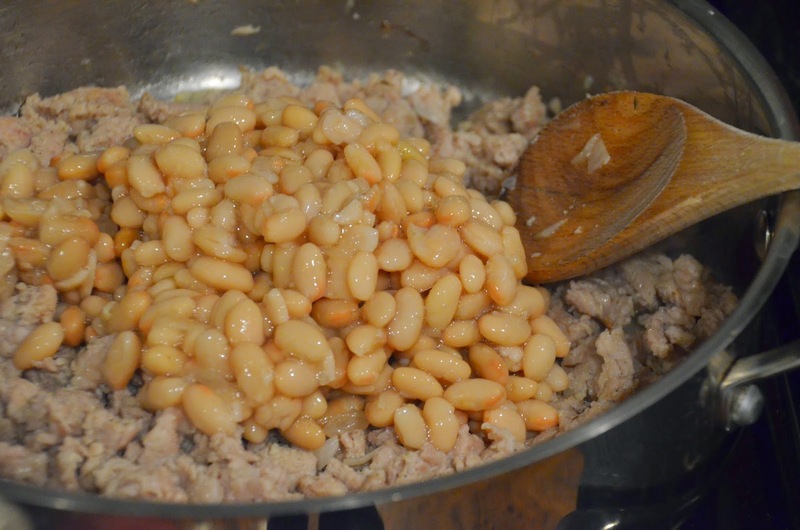 Next up are the beans…there are no true measurements here (this is the joy of cooking) so put in as many or as little as you would like. 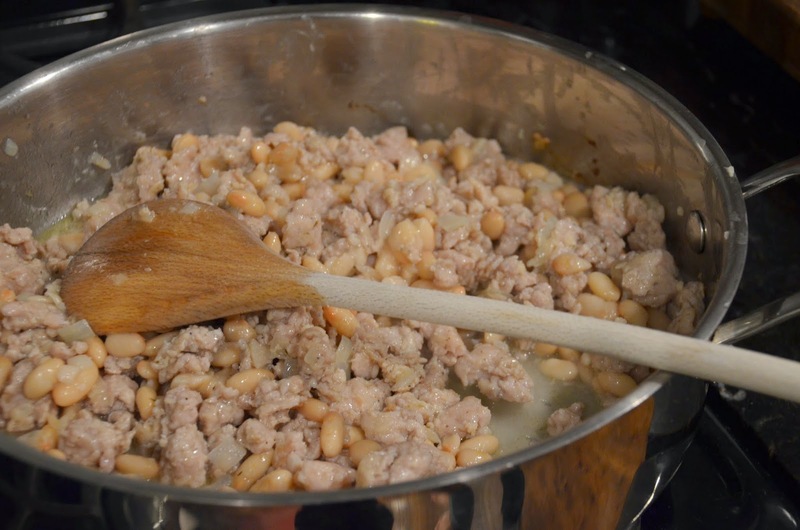 You can drain your beans but don’t rinse them because you really need some of that bean liquid to help thicken the sauce. 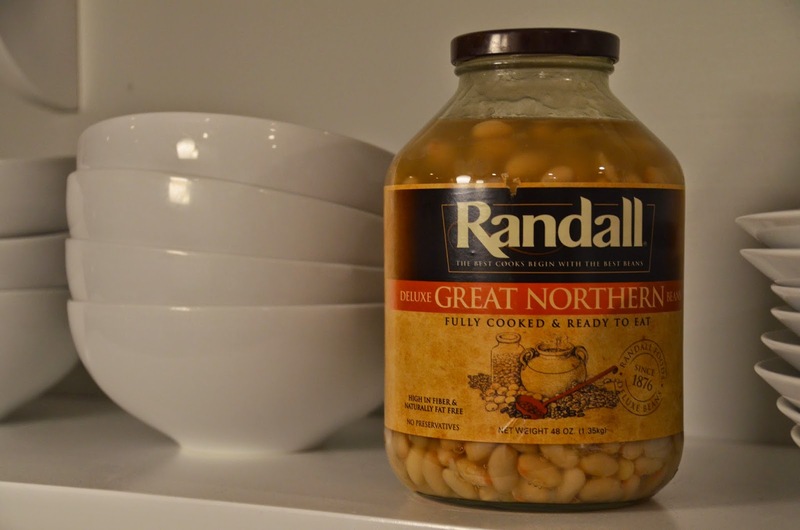 Below is a pic of Randall’s beans…if you want to know how much I love these beans, just read “my favorite things” post and then you will no longer question. Now we need to add some wine and chicken broth…or just add wine…or just add chicken broth (although I highly suggest not omitting the wine). 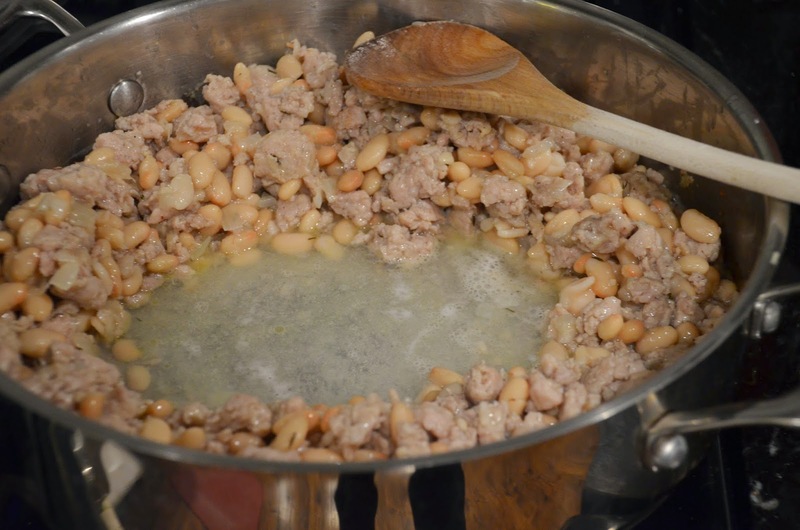 In order for the wine and/or chicken broth to warm quickly, make a spot in the middle of the pan for the liquid to go…This looks like a giant jacuzzi,surrounded by natural rock formations…but in actuality it’s just beans and sausage. Stir this together for about 5 minutes, the liquid will condense and help flavor the dish…wine makes everything better, but you already knew that. This is where you can add a sliced apple if you wish, I didn’t have an apple in the house and the men folk weren’t loving the idea so I indulged their lack of adventure and left it out…I regret my decision. I would HIGHLY recommend adding the apple if you have it. 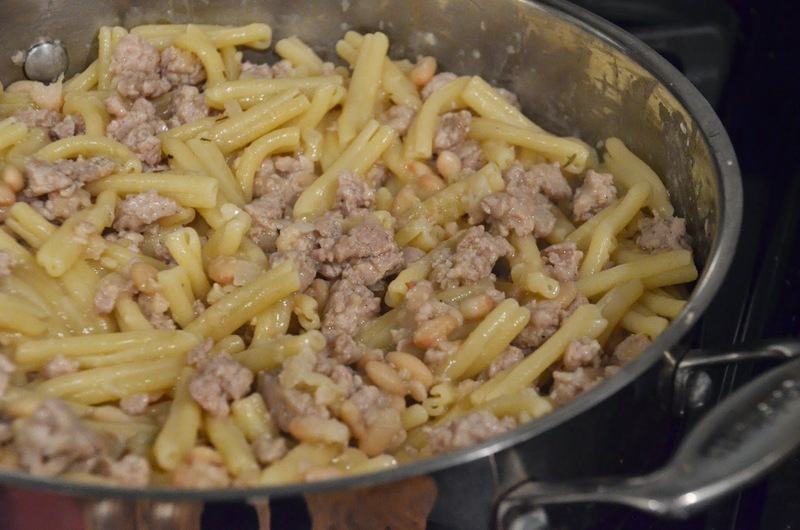 Your pasta should be done by now (8 minutes of boiling is all you need), drain it and add it to the sausage/bean mixture. Oh that is looking good, real good. But we need to add some green don’t you think? I do. 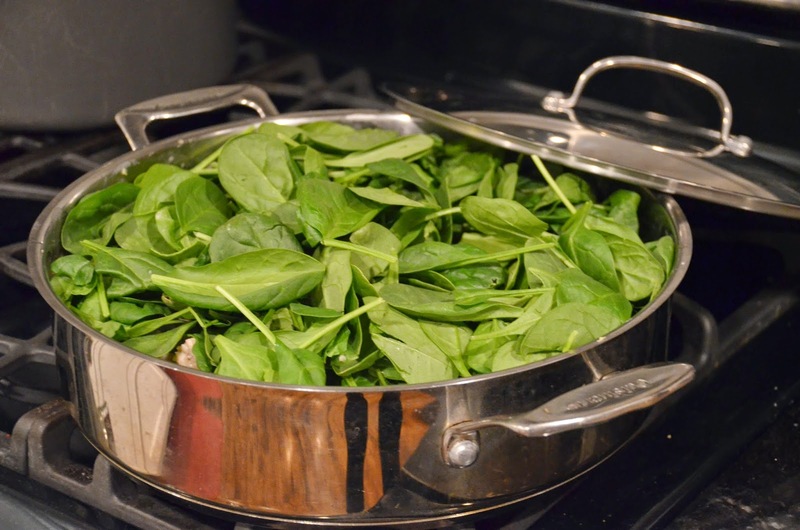 Take a big heapin’ gatherin’ of organic fresh spinach and put it on top of the sausage/pasta mixture…and then put the lid on the skillet. Leave the lid on for a few minutes and then open it up and stir everything around…add your Parmesan cheese and put the lid back on so that the cheese can melt, this only takes about 30 seconds. Dinner’s ready! You might have noted that I didn’t use any seasoning in this dish…that’s because the chicken sausage and parmesan cheese give me all the seasoning I needed to rock this one out. My kids tore this up! Another great success in the quest for kid friendly food that doesn’t cause congestive heart failure…YAY! I hope you guys try this one out…I would love to hear from anyone who’s cool enough to add some apple slices to the mix.